Small solid-tip diamond drill bits are designed primarily for working with delicate jewelry type work. The jewelry bits are used with water for lubrication. The most effective lubrication is obtained when drilling under water, with the material submerged in a bath of water. Expanded international shipping of all items to Canada (except chemicals) is now available. Due to United States Postal changes, we can now ship out all items to Canada. International orders are shipped via Global Priority Mail, so delivery is timely and shipping costs are extremely reasonable. 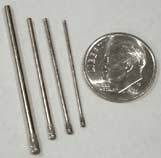 Only diamond drill bits and small items can be shipped internationally to the above countries due to shipping weight limitations. No other products can be shipped in international orders. International orders are shipped via Global Priority Mail, so delivery is timely and shipping costs are extremely reasonable.